Well, truthfully it started long before the ring, but you know what I mean. 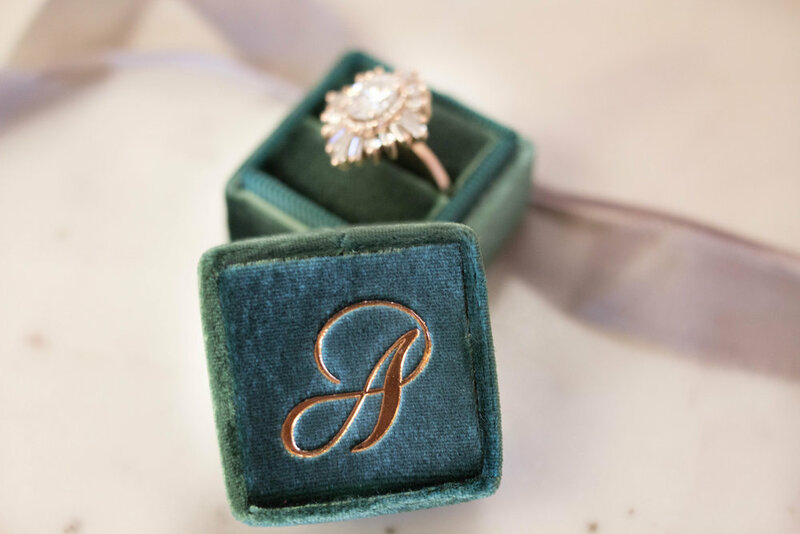 For Brittany Payton of ASE, her Heidi Gibson ring was the perfect way to say "yes" to spending the rest of her life with her fiance, Mike Anderson. Mike popped the question on a weekend trip to Portland, and Brittany and Mike celebrated their engagement surrounded by loved ones. Brittany had been eyeing Heidi Gibson's designs for quite a while, and luckily for her, Mike knows how to take a hint. Brittany's rose-gold oval gatsby engagement ring is pure sparkle and art deco elegance at its finest. The center stone is framed by a petite diamond halo. Outside the halo, alternating custom-cut baguette and round stones cascade at different levels, catching the eye from every angle. The delicate wiring slightly lifts the stones, allowing the light to illuminate from below. Luckily, but not coincidentally, the rose gold color of her ring fit perfectly into Brittany's envisioned color palette for her wedding day. Rose golds, soft yellows and oranges, and deep pinks and emerald greens blend seamlessly together in Brittany's vision. 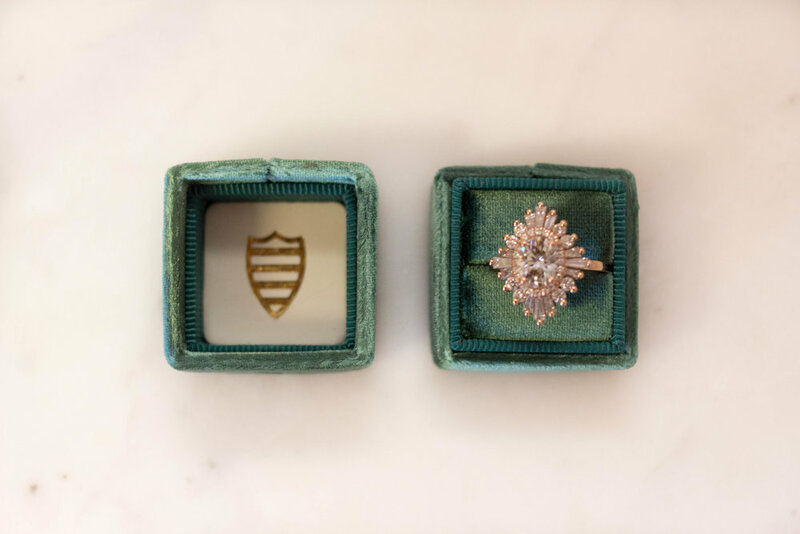 Naturally the first item she needed was an emerald green and rose gold monogrammed Mrs. Box- the iconic ring box seen all over wedding blogs, publications, and Pinterest. Brittany's vision for her wedding day, and the aesthetic of her ring compliment each other perfectly. We asked her about her process of design and her vision for her wedding day. "Ah yes the design! Something I've been so excited to FINALLY get to put together for my own wedding! Although the wedding is taking place smack in the middle of some vineyards, I'm avoiding the whole "wine country wedding" feel. Not that it's overdone, but it's just not my particular style. Since my amazing engagement ring is art-deco in style with that amazing rose gold - I'm taking those elements and incorporating them into our special day. 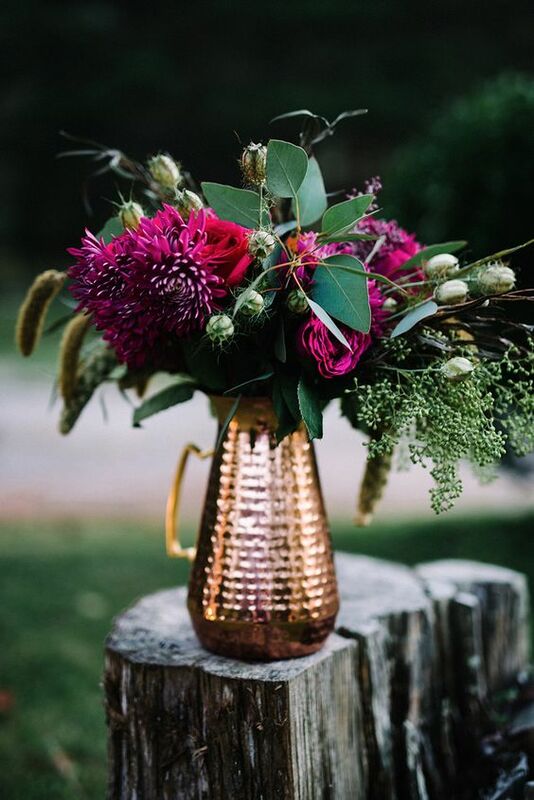 I love jewel tones and copper and by using the natural greenery elements surrounding us I know that it will come together to be what I am hoping for - an elegant and fancy Napa dinner party! Working with Svenja from Chestnut & Vine has been so fun to finally do on a personal level - she totally gets my vision of incorporating some darker tones to play off the natural beauty of the vineyards as well as the dining tables for when that sun sets and we get into twilight...I can not wait to see my one long dining table come to life with all our friends & family members there to enjoy it as well!" Brittany gave us some insight about what it is like to plan your own wedding- when you plan other peoples' weddings for a living. "Honestly after having so many years of experience of planning weddings I have looked at mine in a completely different way...meaning I may not know what I want but I know exactly what I don't want! I am taking a "bridechilla" approach - it's important for the process to be low-key and easy for me. I have already secured all my vendors and I'm just taking the planning process day by day and will not let myself stress out over anything! Plus I have given so much advice to brides to "tune out the noise" so I'm listening to my own advice on that one for sure. There actually has not been one single moment where I have felt stressed about planning my wedding - and I believe having been in the business for as long as I have been has helped me be secure in my decisions - from choosing the venue (my fiance Mike's family's vineyards) to my photographers to the jazz band that will be playing all evening. I haven't once had a panic moment about planning our big day!" "Start with one thing first - meaning focus on what your gut is telling you to do for your big day. Whether she is dreaming of a huge ballroom wedding or an intimate dinner party in the vineyards, know that she has to trust her instincts and not listen to the outside opinions and ideas, because there will be LOTS coming from all angles. At the end of the day, the wedding is a celebration of the couples love for each other and when too many people get involved in the planning process, the bride tends to get super overwhelmed and second guesses all her decisions. Go with your first instinct and run with it...and making a non-refundable deposit often helps in that situation." If Brittany's gorgeous Heidi Gibson rose-gold ring is any indication of what her wedding day will be like, we can't wait to see the finished vision come together. Congratulations Brittany, and happy planning!